Upon accepting the challenge you will automatically become a KIAWC member. You will be asked to post your first act of Kindness on our KIAWC facebook page, tag/challenge 7 others to join the challenge with you. You will be asked to do this for 7 days, with 7 Kindness In Action Acts, Challenging 7 others each day. If the person/organisation you challenge chooses not to accept the challenge they are then encouraged to visit the Kindness In Action World Challenge Fund Us Page and make a donation so we can continue to do more Kindness In Action Activities, Kindness Workshops, and help us to assist other charitable organisations.). Upon completion of your challenge you will be asked to submit your Kindness In Action Report Card and you will be awarded with a Certificate of Completion. Your KIAWC membership will then automatically be elevated to status of KIAWC Leader and you will qualify to wear a KIAWC Leader Pin. HEART, MIND, BODY, & SOUL. It is about learning the importance of being Kind to both ourselves, others, and everything on this Beautiful Planet that we call EARTH. For Kindness In Action ideas please click here. If you have an Act of Kindness you would like to share with us please contact us and post on our facebook page. Why we ask you to challenge others. By asking others to join you in the challenge it will help us create many ripples of Kindness that will turn into waves of Kindness that will spread faster across our beautiful planet. Having a buddy to join you in pursuing a goal/challenge is always a great way to help you keep your motivation high. Plus having a friend along on your journey will not only help us all to develop a Kindness habit faster, it also provides you with moral support. What are you waiting for BE KIND FEEL GOOD join the challenge now. CARRIED OUT BY: JEDAVER OPINGO MISS PROGRESS INTERNATIONAL PHILIPPINES 2016. 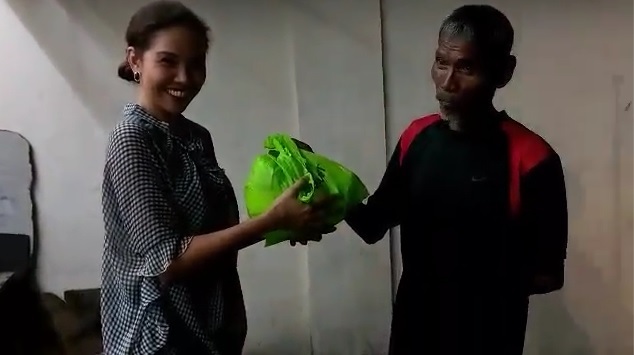 DESCRIPTION: DONATION OF FOOD AND CLOTHES TO THE HOMELESS. IN APPRECIATION OUR HAND SIGN OF A HEART INSIDE A PLANET IS BEING SHOWN.